In order to compensate for the resumption of a cemetery and a small Mosque in Ho Man Tin on the Kowloon Peninsula in 1963, the Government provided land for a cemetery in Cape Collinson, Chai Wan. 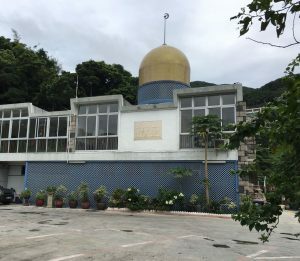 The Government also constructed a small Mosque in Cape Collinson, Chai Wan which opened on August 4, 1963 and was primarily used for the purpose of offering Janazah prayers. 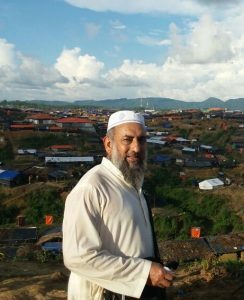 Initially regular prayers were not held especially because it was an isolated area and no Muslims lived there except for a caretaker. As more and more Muslim families settled in Chai Wan they started offering their daily prayers at Chai Wan Masjid. Holy Quran is also taught to children in the Madrassa after school hours every day. The Trustees have renovated the entire building in 2005 and air-condition has been installed in the main prayer hall. The Mosque is surrounded by mountains & rich greenery and enjoys a quiet & peaceful environment. Outside the prayer hall is an open space suitable for small religious gatherings. The Advisory Board of Antiques & Monuments Office designated Chai Wan (Cape Collinson Mosque) as a Grade 3 historic building on 17 May 2010.